Multi Grain Chipotle Salmon Bowls - What the Forks for Dinner? 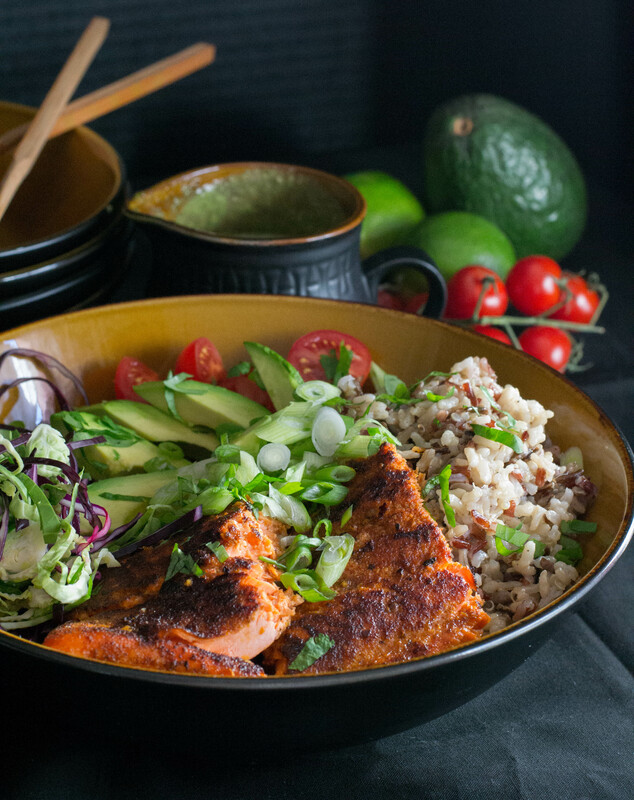 Bowls are the bomb….Multi Grain Chipotle Salmon Bowls are the bomb diggity! 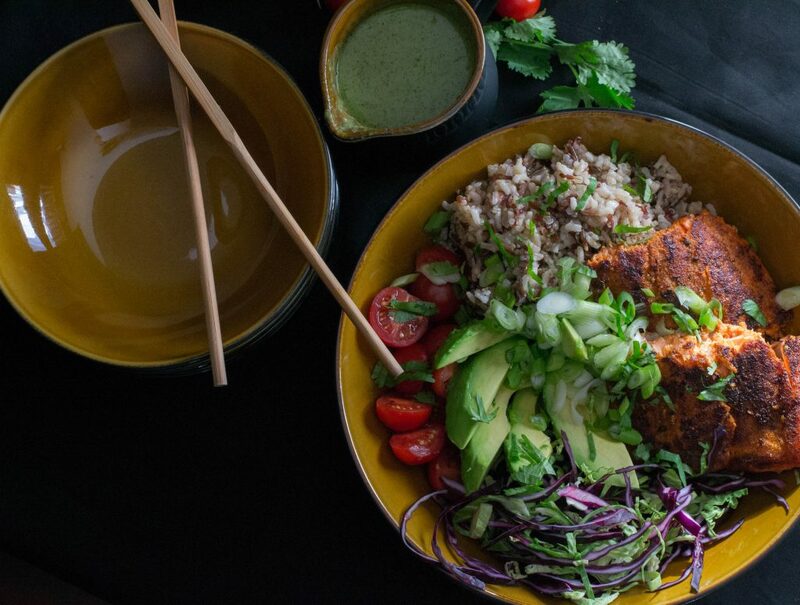 Bowl meals are trendy these days. Everything in a single bowl, and for whatever reason food in a bowl seems more appealing. Maybe its the artful arrangement, or the rainbow of colors, I think maybe just because its the food of the minute. Budda bowls, smoothie bowls, burrito, rice, noodle, polenta,and ace bowls….. the craze goes on. Not to be left out, I decided to make a bowl too. Multi Grain Chipotle Salmon Bowls combine things I love with things Tim loves. I love rice. Tim loves spicy. We both love salmon. This bowl has all of that and more. Minute Rice has an awesome new multi grain medley. Ready in 10 minutes, gluten free, and 100% whole grains. Brown rice, Tai red rice, wild rice, and quinoa, make a slight chewy and nutty flavor that is perfect in a bowl meal. Given the choice of fish, I would chose salmon every time. Full of omega-3 fatty acids, its a healthy way to eat fish. Salmon can be incorporated into any cuisine. Given Tim’s love of spicy, I chose chipotle. Chipotles are smoked dried jalapeño peppers, so not only is there heat , but a smoky flavor as well. Add a bit of smoked paprika, cumin, and garlic and your salmon bursts with flavor. Assembly of the bowl is simple and you can be as artful as you wish. With the spicy salmon I kept the remaining ingredients cool. Cabbage…..I blended red and green, but you can use either separately……tomatoes, avocado, and the multi grain medley, with asprinkle of green onions on top. Creamy Cilantro Lime Dressing is creamy and light combining cilantro, lime and a touch of sour cream to make is creamy smooth. Since I work full time, I do all of my recipes on the weekends. Sometimes I make two or three in one day….power cooking…lol. The day I made this, I had already made several other recipes and was a bit full. I had a small bowl and left the remainder for Tim. When he sat down to eat he told me he wouldn’t eat what was left… it was too much……..the bowl was empty……yeah its that good! 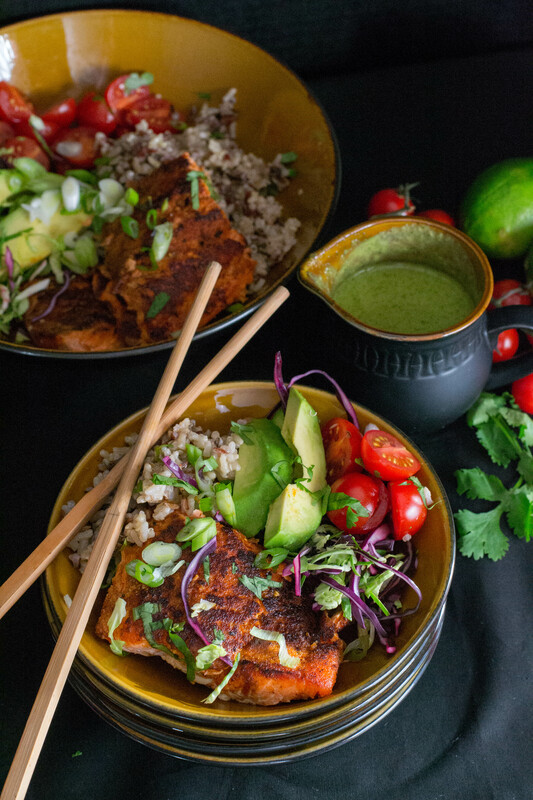 Looking to try a bowl meal? 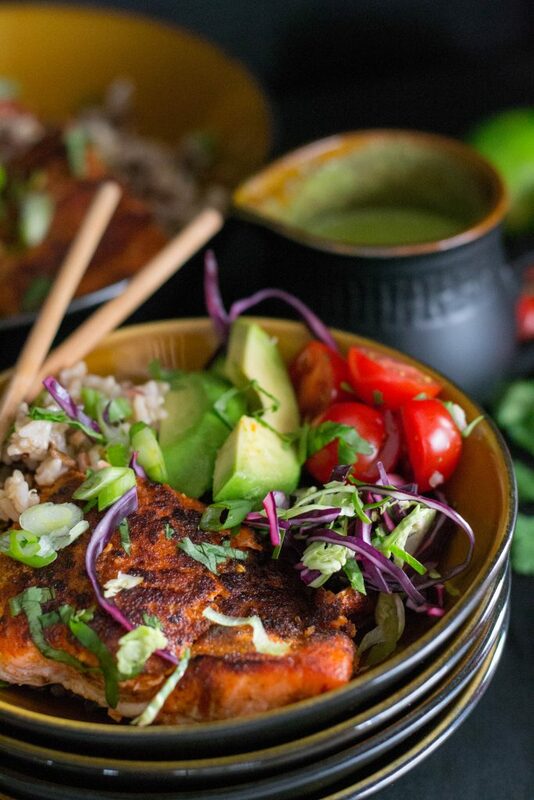 Multi Grain Chipotle Salmon Bowls are an easy, good for you,and a delicious take on the bowl craze!! Cook rice medley according to package directions and set aside. In a small bowl, add chipotle chili powder, garlic powder, smoked paprika, cumin, salt, and black pepper. Stir to blend. Blot the salmon dry with a paper towel and rub spice mixture on both sides. Spray a large skillet with coconut oil spray and heat skillet on medium high.Sear the salmon for 4-5 minute on each side. Remove from heat and set aside. 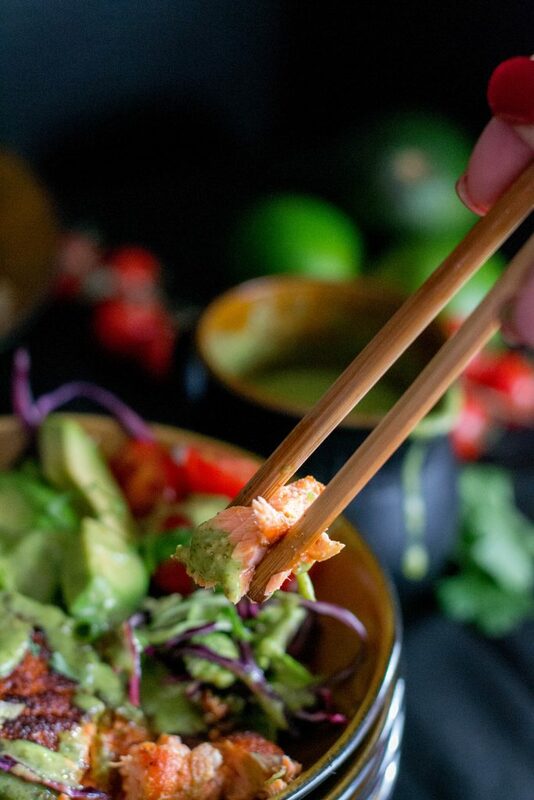 In a blender or food processor add shallot, garlic clove, fresh cilantro, ¼ cup of avocado oil, lime juice, apple cider vinegar, honey, dijon mustard, ¼ teaspoon salt, and cumin. Blend until smooth. Set aside. 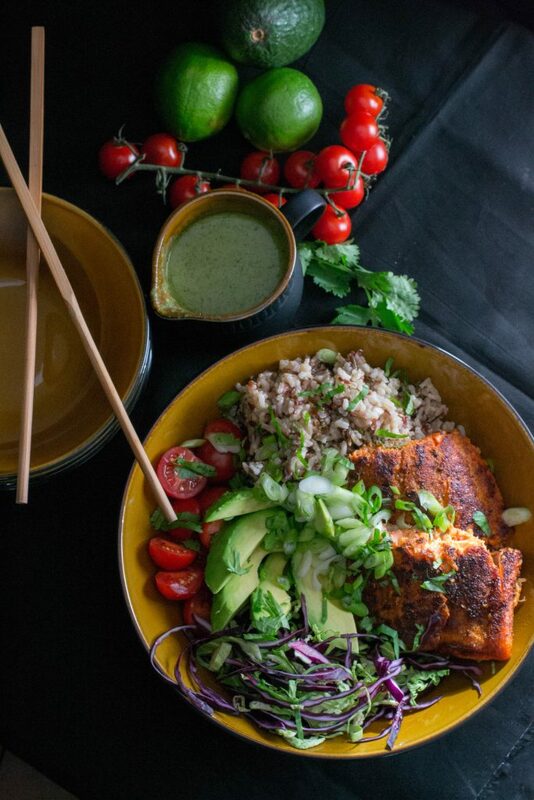 Assemble the bowls: add ½ cup of rice, one filet of fish, 1/4 of avocado slices, ½ cup cabbage, ¼ cup of diced tomato. Drizzle with creamy cilantro dressing mixture and serve!